Johannes Vermeer (1632, Delft, Dutch Republic, to 1675, Delft, Dutch Republic) was a Dutch Golden Age painter who, compared to other artists of the era, had a low output, selling his paintings to selected local dealers. He was respected for his technical abilities, but little is known about his life, and due to his father’s debts likely he may have been self-taught. 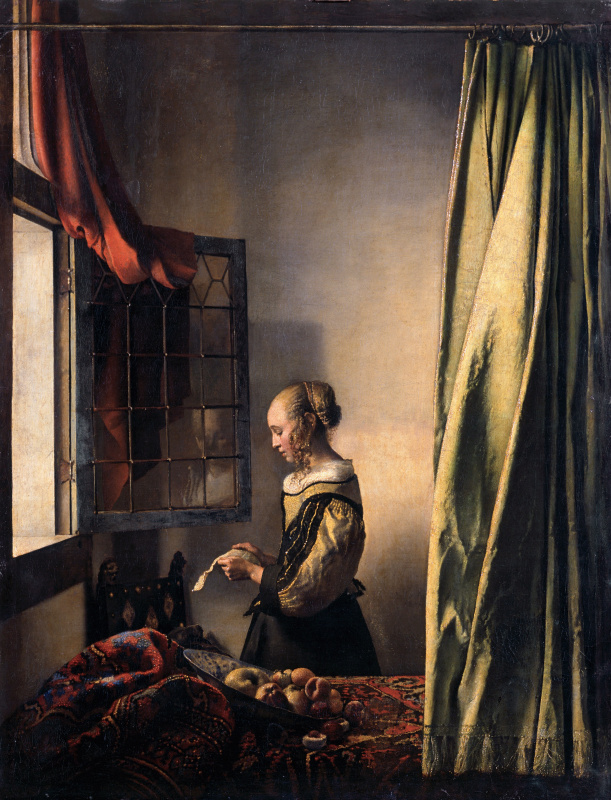 Attributes of His Works: Vermeer is known now for his realistic domestic scenes of all sections of Dutch life, masterfully painted using camera obscura. His brilliant use of light and shadows made simple portraits and street scenes look mysterious and capturing the imagination. He went to great pains to grind the right colors for his paints and managed to achieve results that were both realistic and fantastical at the same time. Famous Works: Diana and her Companions, The Milkmaid, The Little Street, View of Delft, Girl with a Pearl Earring, The Art of Painting. 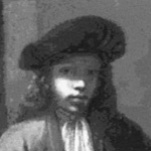 Not much is known about Vermeer’s youth. He was baptized on October 31, 1632, in the Reformed Church and lived in a middle-class family in the city of Delft, South Holland. His father died in 1652 after falling on hard times, and he took over the family art business. A year later he converted to Catholicism upon the insistence of his bride’s mother, who had received a large amount of money from her estranged abusive husband. 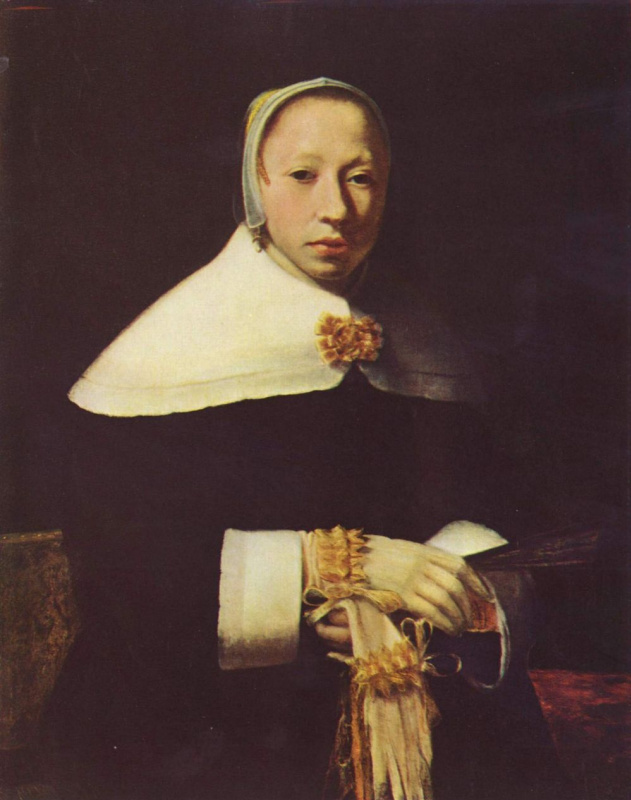 She lived in a large house at Oude Langendijk, and Vermeer and his wife Catharina moved in with her. 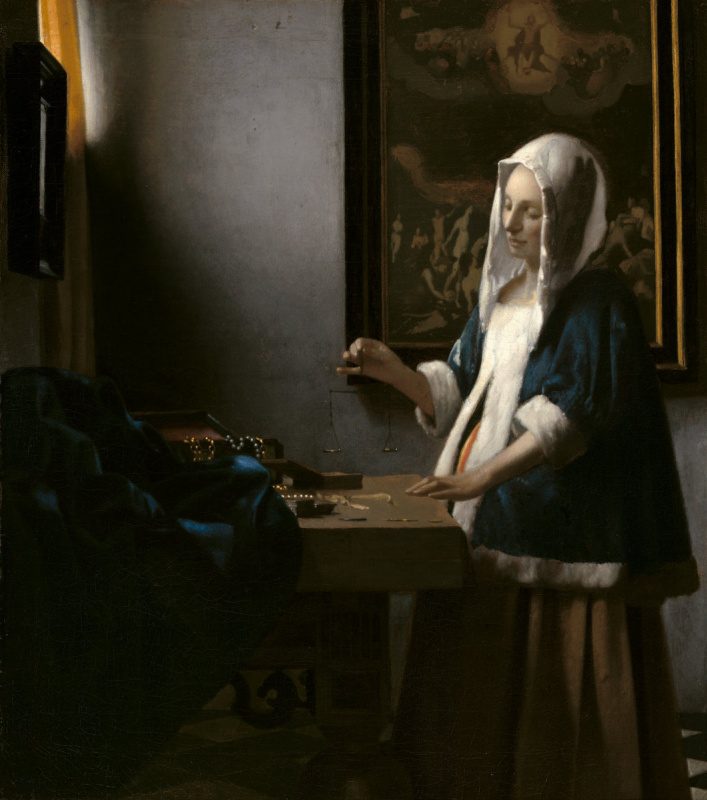 Historians are unsure where Vermeer studied painting, or if he was self-taught, but he joined the Delft Painter’s Guild to help develop his technique and was respected by other artists. Some think that he finished his apprenticeship in Amsterdam or Utrecht. Rembrandt and Caravaggio were likely influences, and some of his earlier work portrayed religious and mythological scenes, before he started painting the domestic scenes he is famous for today. 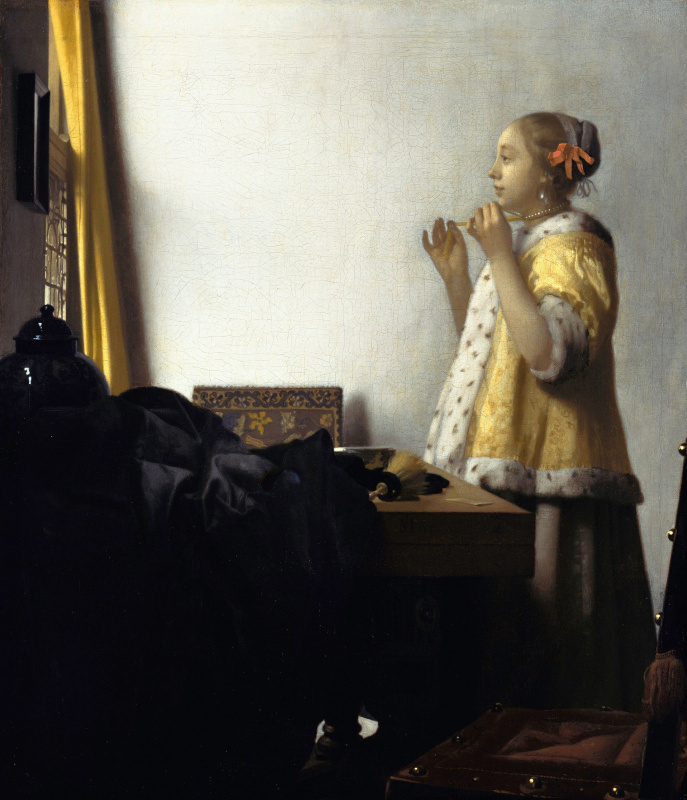 Dutch artists often socialized and competed with each other, riffing off each other’s works like jazz musicians, and many influences of his contemporaries can be seen in Vermeer’s most iconic paintings. Diana and her Companions (1655−1656, Mauritshuis, The Hague) is unusual in that it portrays the goddess of the hunt in a vulnerable and peaceful moment surrounded by nymphs and with one of her hounds looking on patiently as her foot is being washed. All faces, including the dog’s, are either turned away from the viewer or darkened by shadows, adding an element of mystery and solemnness. The painting has been altered at some point, a blue sky added in the upper right corner, and fifteen centimeters has been trimmed from the right side. 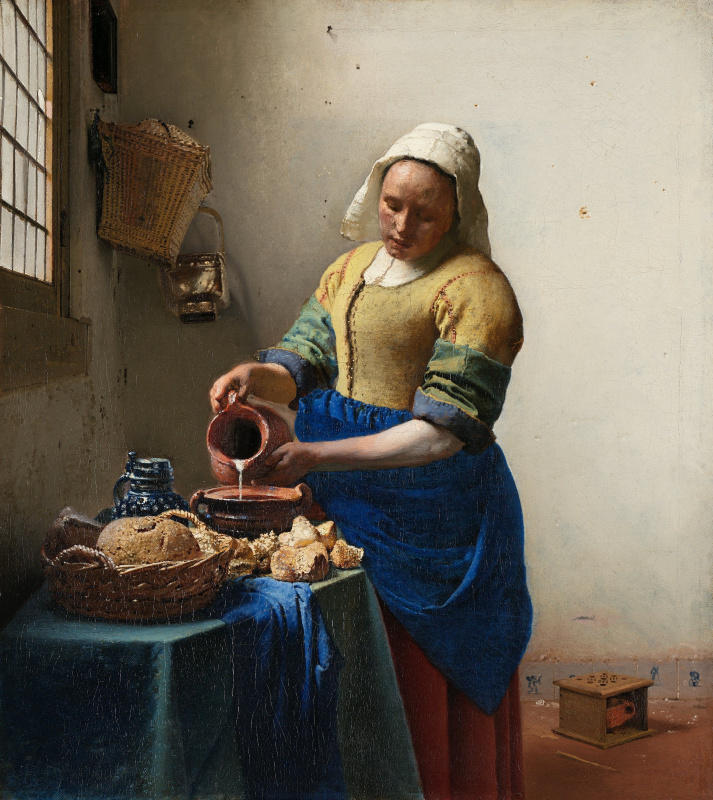 In The Milkmaid (1657−1658 Rijksmuseum, Amsterdam, the Netherlands), Vermeer elevated a house servant to the level of a saint, celebrating the holy nature of domestic housework. The stream of milk falling into the Dutch oven looks real enough to drink, in places opaque and white and in others thin and transparent. Her face shows contemplation and a focus on her work, but it isn’t hard to imagine that there are other thoughts in her head. Behind her is a foot warmer and figures painted onto Delft tiles. Despite its appearance as a realistic portrayal of everyday life for a Dutch house, such paintings were probably meticulously staged and manipulated to create an atmosphere of beauty and harmony. 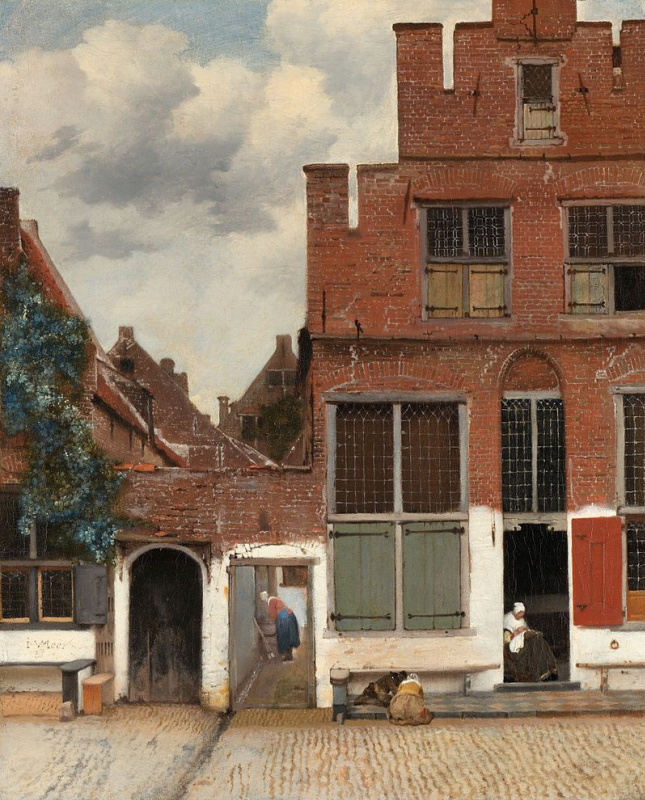 The extraordinarily painted houses featured in The Little Street (1657−1658, Rijksmuseum, Amsterdam) no longer stand and many architectural detectives have tried to figure out where exactly in Delft the little street was located. Vermeer seemed to be sincerely loyal both to his home city and to the Dutch Republic, and this can be seen in the care he put into the detail of each brick in the painting. Upon seeing View of Delft (1660−1661, Mauritshuis, The Hague), French novelist Marcel Proust said "Ever since I saw the View of Delft in the museum in The Hague, I have known that I had seen the most beautiful painting in the world." Despite Vermeer’s love for his hometown, he took certain liberties with the cityscape, placing buildings slightly further apart than they likely were to give it a more balanced and harmonious look. Today the city looks even more different, but thanks to the talents of Vermeer, we can time travel back to the Golden Age and catch a glimpse of what life was like for the Dutch master. Despite the fact that it has been theorized that The Girl with a Pearl Earring (1665, Mauritshuis, The Hague, Netherlands) was actually wearing a costume-jewelry earring of polished tin, this is Vermeer’s most recognized and celebrated painting. The ‘pearl' of her earring is, in fact, simply two brushstrokes, the lower one, reflecting her collar, a little darker than the other, and her mouth is slightly open, as if about to laugh or say something amusing. 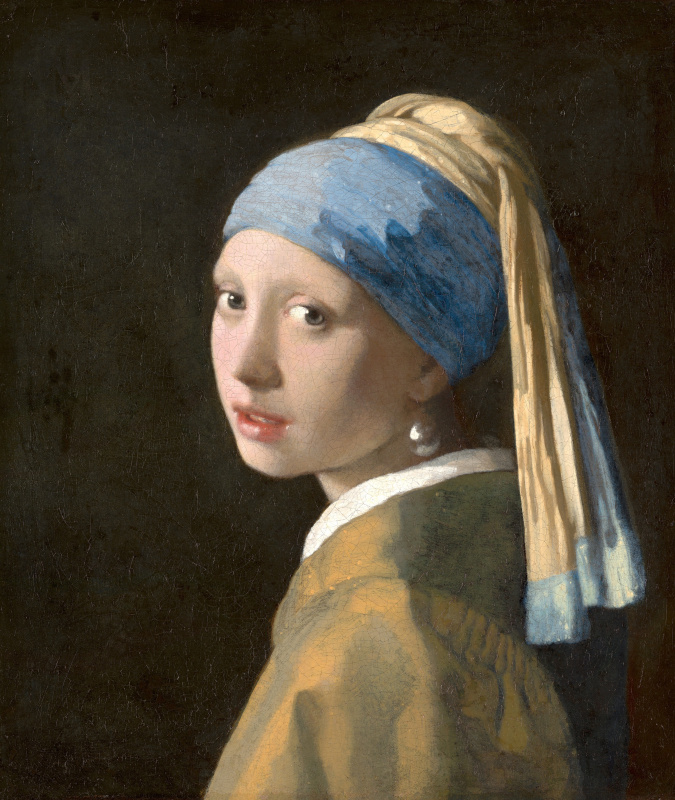 It was this look that inspired novelist Tracy Chevalier to write her book The Girl with a Pearl Earring, fictionalizing the relationship between Vermeer and his servant and model, who she named Griet, played by Scarlett Johansson in the 2003 movie. The dark background, originally a deep green, contrasts the bright colors of her clothes, face and turban. If one were to ask Vermeer himself what his most important work of art was, it is very likely he would say The Art of Painting (1665−1668, Kunsthistorisches Museum, Vienna). He held onto it until his death, despite being deeply in debt, and then Catharina gifted it to her mother so that creditors would be unable to claim it. In 1677 it was sold, and by 1813 it was being shown in the Czernin Museum in Vienna. At some point, someone had forged the signature of Pieter de Hooch on it, thinking that would make it more valuable because de Hooch had been more popular a painter at the time. 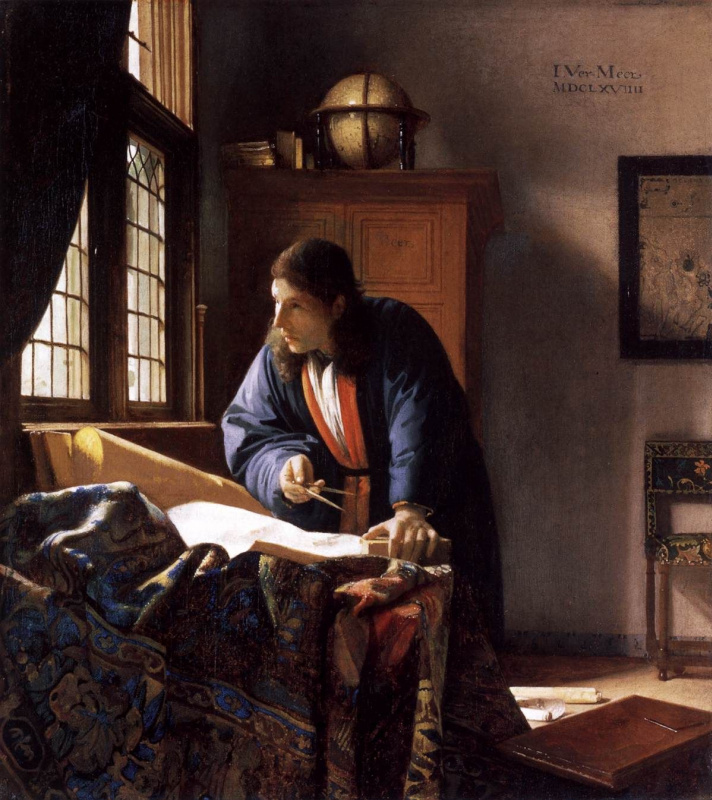 It was finally credited to Vermeer only in 1860. In 1940, Hitler, in his attempt to acquire the best European artworks for a planned museum, purchased The Art of Painting for 1.82 million Reichsmark. Luckily, it survived the war hidden in a salt mine where it was found by Allied soldiers. It was presented to the Austrian government by the United States in 1946. The painting itself is fascinating for the way it pulls the curtain, rather literally, on an artist’s studio, revealing to the viewer the mysterious artistic process. Except that, like most other Dutch art of the Baroque era, it was an idealized vision, attempting to convince the world that painters wore extravagant and expensive clothing while they worked in a pristine and elegant workshop, perhaps to elicit more respect for artists. The curtains seem to be slightly out of focus, likely painted with the help of a camera obscura, giving it a depth and realism. 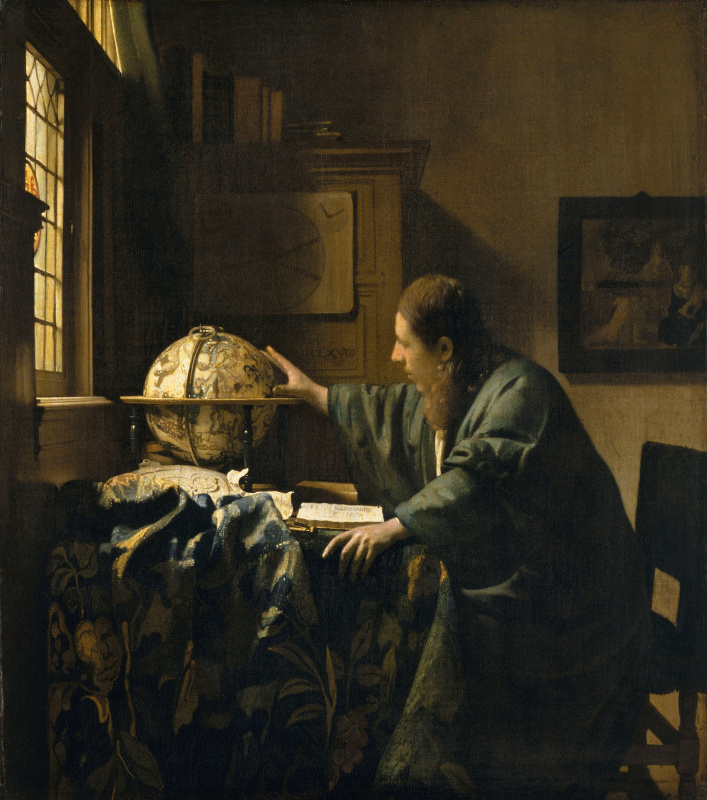 The model for the painter is a woman dressed as Clio, the muse of history, and the light realistically falling on her face and blue dress, as well as the chandelier, metal studs, and curtains, and the play of light and shadow on the map on the wall, perfectly illustrate Vermeer’s mastery. It is also his largest piece, at about four feet by three feet, indicating that this image, along with its straightforward title, is how he wanted people to assume that the artistic process looked like. It made a big impression on Salvador Dali centuries later, when he dedicated several works to Vermeer, including The Ghost of Vermeer of Delft Which Can Be Used As a Table. With war ravaging the Dutch economy, Vermeer, a respected but not very famous painter and art dealer, found himself deep in debt and unable to provide for his eleven children. His wife claimed that it was this stress that killed him quickly after falling ill, and he was buried on December 15, 1675. 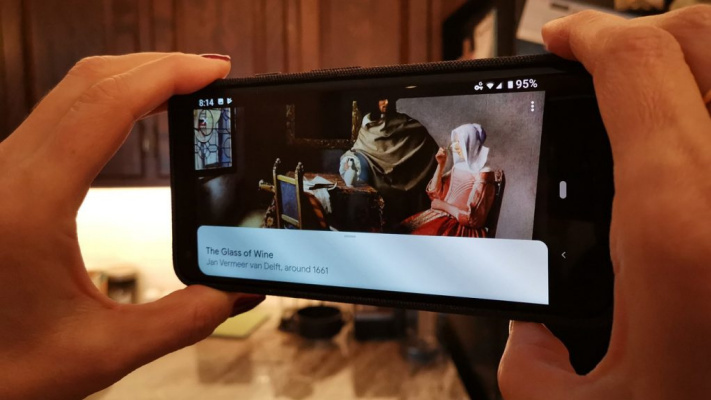 Now to see all of Vermeer's works in one place everybody needs just the Google App. A new augmented reality gallery brings the Dutch master’s 36 paintings to your phone.